Taser issues "target zone" to "minimize controversy, increase effectiveness"
(CNN) -- The maker of Taser stun guns has advised law enforcement agencies to avoid hitting suspects in the chest, partly "to minimize controversy." A Taser either fires electrified darts or can be pressed directly against a person to stun and immobilize them. "Taser has long stood by the fact that our technology is not risk free and is often used during violent and dangerous confrontations," Taser International spokesman Steve Tuttle said in a memo referring to an October 12 training bulletin. "The issuing of a preferred target zone is a prime example of training advice based on best practices and field results to minimize controversy, increase effectiveness and provide enhanced risk management," he said. A Taser is a weapon that either fires electrified darts or can be pressed directly against a person to stun and immobilize them. The devices with cartridges deploy two probes that may or may not go into the skin, according to the company. Sudden cardiac arrest, a leading cause of death in the United States, often occurs in the midst of an arrest, Taser International said in the bulletin. If a stun gun is discharged to the chest, a lawsuit likely will follow, charging that police used excessive force, the document said. Plaintiffs could charge that the electronic control device caused an arrhythmia, or a disruption of the heart's rhythmic beating, the advisory said. The company advises aiming a Taser at a person's back, pelvic muscles or thigh. Amnesty International has been one of the most vocal opponents of the Taser, expressing concern on its Web site that the device is being used as a tool of routine force, rather than as an alternative to firearms. The human rights group says there have been insufficient medical studies on the effects of Tasers, especially their use on potentially at-risk people -- those with medical conditions, people who take prescription medications, people who are mentally ill or those under the influence of narcotics. 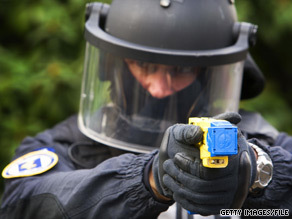 Amnesty International has made several recommendations to police departments, including asking law enforcement agencies to suspend using Tasers until thorough studies are done on their effects, or limit their use based on specific policies, to use them only in situations when the alternative would be deadly force and to refrain from using the devices on unarmed suspects who are argumentative or trying to flee a crime scene. The Pensacola, Florida, Police Department banned the firing of Taser guns by officers from moving vehicles after the death of 17-year-old Victor Steen earlier this month. Officer Jerald Ard pursued Steen early on the morning of October 3 after spotting him at a vacant construction site. Police said Ard fired his stun gun toward Steen when the teen fled on his bicycle. Although the Taser bolt missed its target, the teen eventually crashed his bicycle and fell into the path of the police car, according to Pensacola Assistant Police Chief Chip Simmons. The incident raised questions among some about safety procedures when it comes to using the weapons.